Wouldn’t it be great if the solution to all your problems really was in that Vitameatavegamin bottle? Can’t find that ancestor? Take a spoonful of Vitameatavegamin! Struggling to figure out that source citation? Missing records from the courthouse? Don’t have enough time in your day for everything you need to get done? Another spoonful of Vitameatavegamin to the rescue! Or, in this case, myself. I could rebuild my productivity and time management skills. I had the technology. I could make myself better than I was. Better, more productive, a time management master at home as well as at work! So I sat down at my computer and continued researching best practices for productivity and time management. I had already implemented email and calendar access on my smartphone. My smartphone is my brain. I don’t leave home without it, I make sure it’s always backed up and updated and it serves as my personal assistant in all things. But what I discovered, as I read about different productivity and time management systems is that there were people in the world who were using their smartphones far, far better than I was. Then, I ran across a post about Inbox Zero and became obsessed. Inbox Zero was developed by productivity expert, Merlin Mann and it’s goal is exactly what it sounds like…an empty (or close to empty) email inbox. Could I reach Inbox Zero, I wondered? I couldn’t actually remember the last time I didn’t have emails just sitting in my email waiting for me to deal with them. As I continued to read articles and blog posts and responses to the time management assignment in ProGen I heard about the time management method called “Getting Things Done” and was intrigued. If you’ve never heard about “Getting Things Done” by a productivity consultant named David Allen. Wikipedia has a good description of the method here and Lifehacker has a great post that breaks down how to get started with GTD here. But my “AHA!” moment came when I read Jamie Todd Rubin’s post Going Paperless: My Process for Keeping Evernote Clutter-Free. Jamie provides a graphic illustrating his clutter-free process in the post that really hit home with me and it was exactly what I’d been looking for to help me understand what to do next. So I combined bits of GTD with Jamie Todd Rubin’s clutter-free process and…drum roll please!…actually achieved Inbox Zero!!!!! But not just on my emails, I also managed to completely clean out my Feedly newsfeed as well! My dear friends, I can’t tell you how good it felt to see this! And now that I’ve successfully achieved Inbox Zero it feels less overwhelming whenever I open my email or Feedly. I’ve now scheduled time each day to review and act on all (or most) items in my inbox and Feedly. My next project is cleaning up my Pocket feed. Gmail – I have a couple of Gmail addresses that I use, one for personal items, one for genealogy, one for my HAM radio-related emails and one for junk. I set up my personal email to also accept my genealogy and HAM radio emails, using filters to give them special labels and by-pass my inbox completely. I can then review each set of email separately without having to log in to the different accounts. I looked at the multiple inbox lab option in Gmail but just didn’t love the way it looked. Trello – Trello is a service that helps organize your projects. It’s well-known in the business world as a project management and collaboration tool that utilizes boards, cards and lists. I set up a board for my to-do list and used the email to board feature to start creating cards from my emails for items that needed to be handled. I also use it to collect and organize ideas for my blog as well as use it to collaborate with my family on our genealogy. Zapier – Zapier is a service that connects together two web services. Think cause and effect for the digital age. You select the services you want to integrate (for example, Gmail and Trello), set up a “Zap” (basically a recipe) and turn it on and it helps you automate tasks. So in the example of Gmail and Trello, I told Zapier whenever an email came into my inbox that met certain criteria a new Trello card should be set up on my to-do board. One less thing I have to manually do which means time saved. Pocket – Pocket is a service for managing items you want to review at a later time. You can save articles, videos and more. This is my “middle man” for items I want to read later but don’t want to clutter up Evernote with until I decide whether I want to keep the item permanently or not. Feedly – Feedly is a news aggregator that compiles news feeds from various sources for a centralized reading location. I use it for reading blog posts from other bloggers. Evernote – Evernote is a service for note-taking, organizing and archiving. I use this to store items I want to keep permanently and refer back to later. This may sound like a lot of things to use but once you get everything set up correctly it actually saves time. The next step was to sit down with my email inbox and just start slogging through it. I adhered strictly to the “Two-Minute Rule” in GTD. The two minute rule basically states if you can read and reply to an email in two minutes or less you should take care of it immediately. Otherwise it goes into a follow up area. Then you schedule time to take care of items that you’ve filed in your follow up area. I spent a full day going through my email inbox learning how to identify items that could be handled immediately, what needed to go in follow up, what could be added to my calendar, task list or Trello board and what needed to be stored in Evernote. I did the same with my Feedly news feed using Pocket as my “middle man” for things I wanted to save and read but would take longer than a couple of minutes to review. Once I finished weeding and organizing my email I determined what items I could use Zapier to automate and set up Zaps for those items. In Trello I use the reminder feature, tagging and email to board or email to card features. In Evernote I use the notebooks and tagging features. In Gmail I use filters, labels and the check mail from other accounts settings. While this system may work for me others won’t find it so useful. A system of organization is a very personal thing and, unfortunately, a spoonful of Vitameatavegamin won’t fix productivity and time management problems. If you’re looking for a way to reach Inbox Zero, spend some time looking at the different systems out there right now. Maybe whiteboards and post-it notes are your thing or you’d rather have a spiral-bound notebook next to your computer. Whatever system you try, don’t get discouraged if it doesn’t work for you on the first try. Keep trying other systems and eventually you’ll find something that works for you. If I can do it friends, so can you! 1 Oppenheimer, Jess, Madelyn Davis, and Bob Caroll, Jr. “Lucy Does a TV Commercial.” I Love Lucy. Desilu Productions. Hollywood, CA, 5 May 1952. Television. 2 Schwartz, Elroy. “Population: Zero.” The Six Million Dollar Man. Silverton Productions. Universal City, CA, 18 Jan. 1974. Television. Thank you for your helpful post! I definitely need to get more organized. Your list of services looks similar to mine. I also use Gmail, Feedly and Evernote. I’ve tried Trello in the past but switched over to Wunderlist. I’ve also used Pocket, but not as much lately. I like how you use Pocket as a middle man before saving items to Evernote. I’ve never heard of Zapier. Congrats on getting organized! 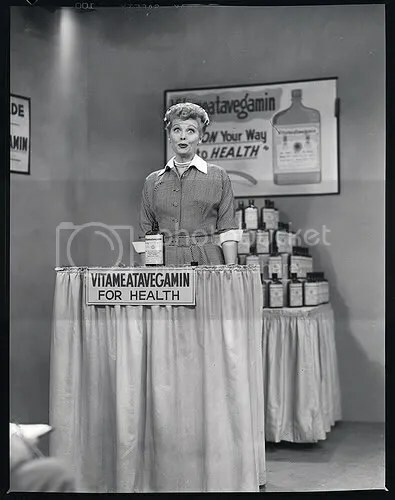 Oh, and I love how you began your post with Lucy’s Vitameatavegamin commercial. Haha! Thanks for your comment Jana. Hopefully now that I’ve started this journey to organization I can maintain it! You mentioned having your multiple emails bypassing your inbox using filters and not having to sign in to multiple accounts. Would you please share how you did this? Thanks for stopping by Patricia! It takes a few steps to get everything set up but I think having all my emails come to one inbox really helps. I’ve included detailed instructions in my newest blog post at http://talkingboxgenealogy.com/wp/productivity-progress-follow/. I hope it’s helpful to you! Thanks for the shout out Jana!